Above image is of Helena Charithaya. [Read/view] a booklet on ‘Helena Charithaya’ the Sri Lankan stigmatist. October 4, 2015 - Reported [here]. Little Gonawila waits in hope. Moves are underway to begin an inquiry into the canonization of stigmatist Helena, 84 years after her passing. Kumudini Hettiarachchi reports. A whisper of hope and a formal request sent across the ocean on the wings of prayer to the Vatican in Rome. With the Bishop of Chilaw, Rev. Dr. Valence Mendis, requesting the Congregation of Causes of Saints to begin an inquiry which is the first step towards beatification and canonization of a person, the little town of Gonawila in the Thoppuwa area is agog. For Gonawila, part of the Bolawatte parish, off the Negombo-Kochchikade Road, just beyond the bridge spanning the Maha Oya, was home to ‘Helena’. It is as we cross the road from the Gonawila Roman Catholic Church to the graveyard and stand before the evocative statue of the dying Christ with His Stigmata (the five Holy Wounds he suffered during His Crucifixion) that the significance of the life of Helena comes into focus. Her grave lies close by, but it is through the eyes of 92-year-old Mary Winifred Perera Dissanayake that we go back in time to see why Helena was extraordinary and deserves to be considered for beatification and canonization. Winifred was a little girl of eight when Gonawila was gripped by sorrow. She remembers like yesterday, how crowds thronged the tiny home of Helena in the churchyard, as she lay breathing her last. Although given a small slap by her aunt and warned not to mingle among the huge crowd as she could get lost, Winifred managed to dodge in-between and make her way to the fringe. “People were surrounding Helena and dipping pieces of cloth in the blood that was flowing from one wound on the right side of her chest and others on her hands and feet, similar to those suffered by Jesus Christ Himself,” says Winifred, recalling that day, February 8, 1931. In lamentation, weeping women were around Helena carrying Bibles and it is many of them who described how there was the sweet-scent of roses about her body. And even now, 84 years later, people still say that the tiny pieces of cloth with her blood now turning brown are bringing about favours — curing illnesses, sorting out job issues, ending marital woes and helping to overcome children’s troubles. A small building in the churchyard, meanwhile, has been made the repository of the items that Helena used during her Spartan but prayerful life, helping hundreds of men, women and children. 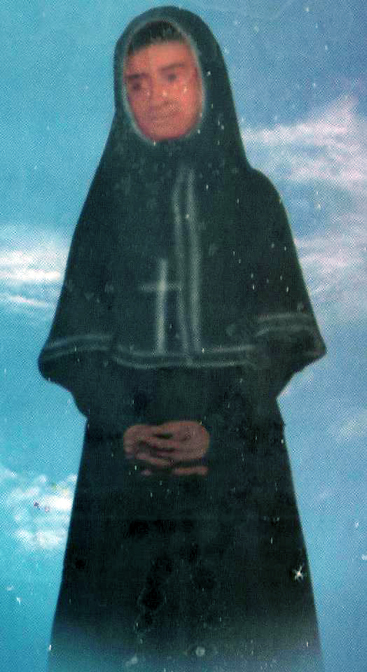 A bronze cross which she held tightly when she prayed over the sick or the childless, some miraculous medals she always wore, the black veil that she donned when she prayed and even the thimble that she used when teaching younger women to sew. The request to begin the inquiry for the beatification and canonization of Helena has gathered momentum with able guidance being provided by the Parish Priest of Gonawila’s St. Joseph’s Church, Fr. Claude Hyacinth, who took over the area in May last year. Having read in 1992, ‘Helena Charithaya’, a booklet on the Sri Lankan stigmatist, first written in Sinhala in 1945 by the former Bishop of Chilaw, Rt. Rev. Dr. Edmund Peiris (now no more), and then translated by Fr. D.F. Medagoda, Fr. Hyacinth was only too eager to take up the call of his flock to elevate Helena to a higher status than a mere mortal. It is through ‘Helena Charithaya’ that we are able to piece together her life and the events which seemingly qualify her for this honour. Pointing out that the facts in ‘Helena Charithaya’ are not based on hearsay, but on contemporary, trustworthy and very reliable documents, all hand-written in English, Latin, French, Spanish or Italian, Dr. Edmund Peiris has detailed them as the diary of Fr. Florentino Garcia who was Helena’s Spiritual Director; his letters and the Certified Report written under oath; and short notes on the examination of Helena, conducted by the Vicar Apostolic of the Jaffna diocese, Very Rev. Dr. Christopher Bonjean, under whom came Bolawatte at that time. Born in the latter part of 1848, there was no schooling for Helena in her childhood, either to learn the alphabet or the religion, but she joined her two sisters, for just two months in studying catechism, when they were preparing to receive first Holy Communion and Confirmation. Helena by then was 12 years old and the Bolawatte Parish Priest was Fr. Garcia. Not having learnt her letters, Helena was unable to study religion by reading books and as such the art of meditation and spending time with God was taught to her by someone who had her training at the Jaffna convent. Gradually, more joined Helena and her sisters. As the news spread, people flocked to see Helena. The Bishop then ordered her to come to Holy Family Convent, Kurunegala, for an examination by a doctor, a Protestant, as to her physical condition, with the Bishop himself conducting the canonical examination. The doctor’s report of April 9, 1872 states: “I found on each hand in the centre of the palm and oval space two marks about ¾ inches in length and about ½ an inch in breadth, in which the skin was smooth and of a darker tinge similar to that of cicatrices (the scars of healed wounds); in the centre of this space there was a hard ended and raised mass like dry blood. This was about ½ an inch in length and less than ¼ inch in breadth. “One similar mark was found in the dorsum of each hand; these were in places corresponding to the marks on the palms. Four marks similar to those on the hands were found on the feet, two on each foot, and one on the dorsal and another on the plantar surface. On the right side a little below and to the outer side of the breast, I found a mark two inches in length; here the skin appeared to be superficially cracked, this being surrounded by a margin of smooth and dark coloured skin about one quarter of an inch broad; this was situated horizontally. “I examined Helena on March 14, the day following the first examination during a trance. I saw her about 3 p.m. She was quietly sitting and the hands and feet were not bleeding. I then waited in an adjoining room, the door between the two rooms being wide open. At 3.30 p.m. her sister informed me that Helena was going into a trance and I hastened to her. She was lying on her back, her arms outstretched, the hands being about 18 inches from sides, the dorsal surface being pressed to the ground the legs stretched and over each other, the lower part of the right leg crossing in front of the left, the plantar of the right foot being closely applied to the back of the left foot. Blood was issuing from the palms, the dorsum of the right foot and the plantar surface of the left foot. It came from between the masses of dry blood forming the centre of the mark; a portion of it was bright red and the larger part was dark red and from each of the four places about a dram of blood escaped. She was apparently slightly conscious at first but, soon appeared quite unconscious.” It is with all these testimonies that the faithful of Gonawila await, in prayer and hope, an answer from Rome. Facebook [page] on Helena Charithaya.